Before talking about the next card in Angel tarot, 8-Justice, I need to explain something. The Justice card was originally the 8 card in the Rider-Waite (RW) tarot until 1909 when the 8-Justice and 11-Strength cards were switched. While I can find no reason for this flipping of cards, I note that in the Angel Tarot deck the numbering of cards follows the original RW sequence. This helps to keep continuity with The Dreamer’s journey. The Justice card reminds us to always do what is right. Drawing the Justice card indicates that following what is right, will ensure things go our way. However, if you have legal contracts, they should be reviewed carefully before signing. Looking at 11-Justice in the RW tarot we see a woman holding an evenly balanced scale in one hand and a sword in the other. Some say the Justice card stands for karma, a balancing of actions. Remember that justice represents what is just, not necessarily fair. Justice requires objectivity, reviewing things with emotional detachment. Justice suggests taking a look at the way we have treated others along our journey. Justice can also indicate a time for activism. If we are witness to injustice or unkindness in the world, we are asked to stand up and speak out. The symbolism of Angel tarot shows Archangel Raguel floating between two pillars. He carries balanced scales to show objectivity. In his other hand, he carries a sword indicating that justice can be double-edged. On one side we have fairness and on the other there is the expectation of accountability, demanding great integrity. The number 8 is often associated with material prosperity and abundance. Additionally, the shape of the number, a circle on top of a circle, shows balance, signifying karmic balance. 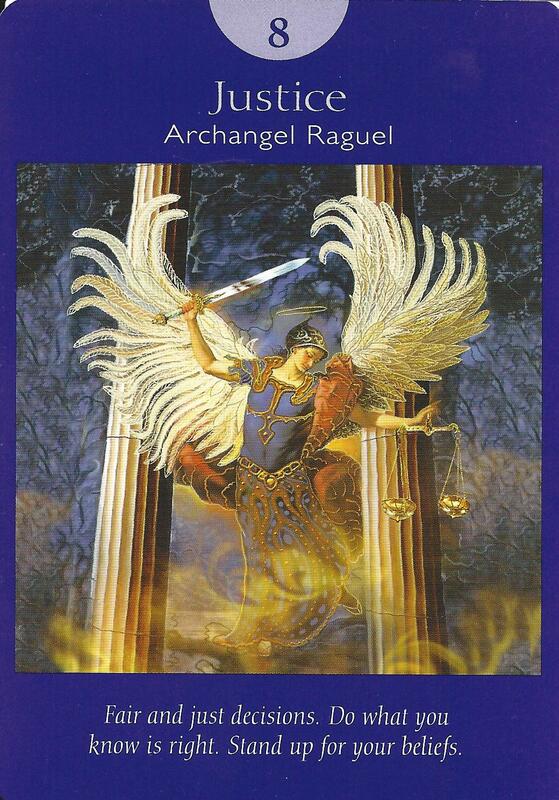 Archangel Raguel is often called upon when we find ourselves in potentially challenging situations. He has the ability to soften the energy leading to compromise and reconciliation. 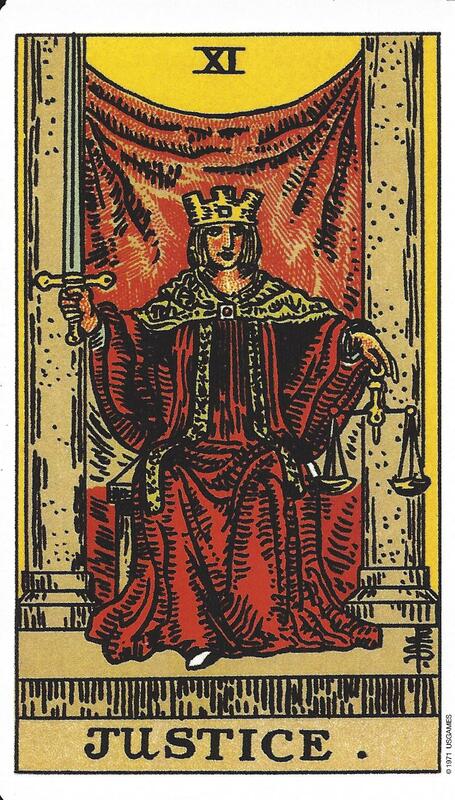 Frequently when the Justice card is drawn is signifies the Querent is challenged trying to make some type of decision. It reminds us to be objective and thoroughly consider all aspects before coming to a decision. By doing this we can be assured that the decision will be in our favor whether it be a legal resolution or some other type of decision. It is a reminder to do what is right and take responsibility for our actions. It calls for us to stand up for what we believe in. It can also indicate that it is time to accept or issue an apology for any decisions that were made without Justice in mind.